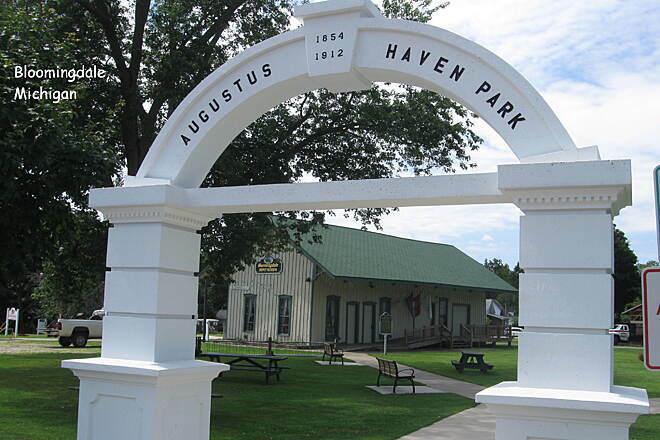 More than a half-dozen old railroad towns between Kalamazoo and South Haven offer rest and replenishment to travelers using the Kal-Haven Trail. 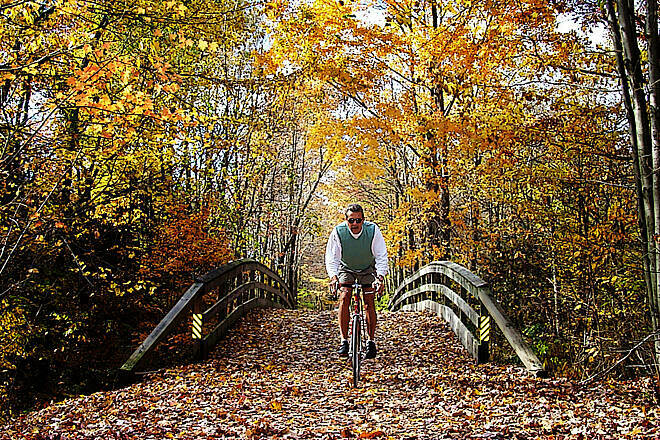 The 34-mile crushed-limestone rail-trail links these towns as it rolls across the bucolic landscape of southwestern Michigan, from the outskirts of the bustling city to the resort town on Lake Michigan. 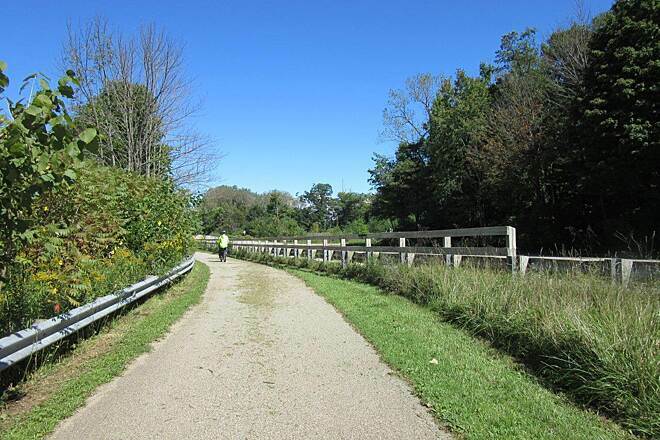 The trail follows the rail bed laid down in 1870 for the Kalamazoo & South Haven Railroad, which was almost immediately purchased by the Michigan Central Railroad. The New York Central Railroad took over the line in 1950 and ran trains on it until a 1968 merger to create the Penn Central led to the line becoming disused in 1970. 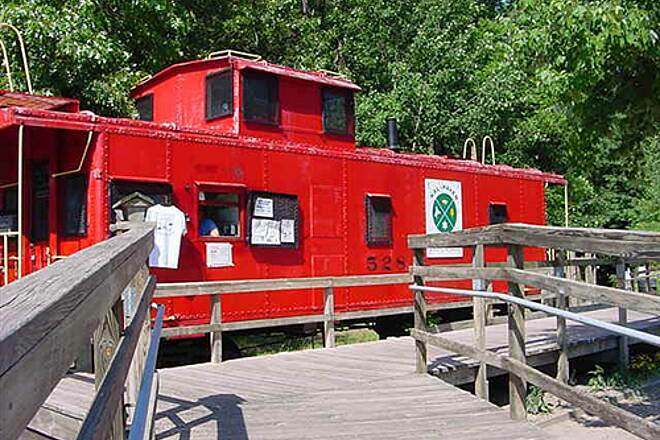 Opened in 1991, the trail is one of the oldest conversions in Michigan. 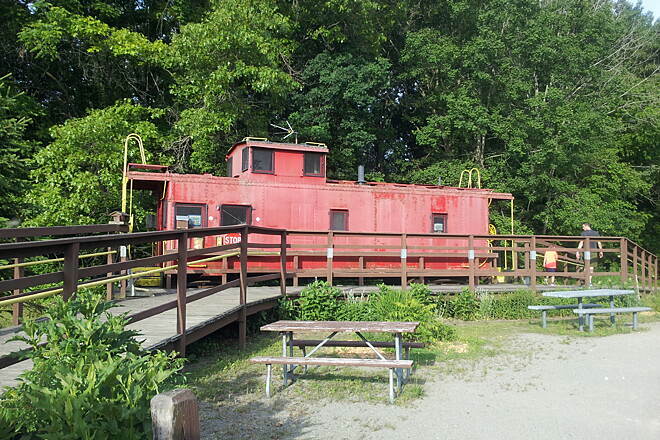 Old depots serve as trailside visitor centers in Bloomingdale and South Haven, and an old red caboose offers trailhead services on the outskirts of Kalamazoo. The majority of the route is crushed slag and limestone and slopes gently down toward the lake; note that while the trail can accommodate road bikes, the crushed stone may prove challenging in a few sections. 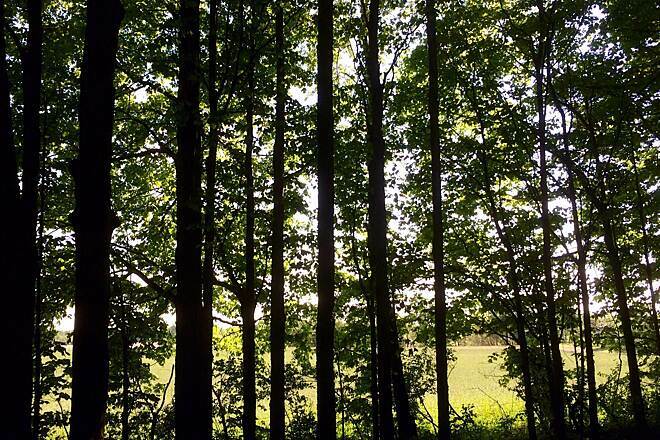 Beginning on the outskirts of Kalamazoo, where the trail meets the western endpoint for the Kalamazoo River Valley Trail (see previous profile), you’ll pass through 7 miles of tree shade before entering the open fields of Mentha. Almost nothing remains of the old Mentha Plantation, which built this area’s reputation for producing the world’s finest peppermint oil in the early 20th century. You’ll pass the south edge of Gobles, which has services, before you arrive at the restored Bloomingdale Depot that houses a museum filled with railroad and local history at about mile 18. An adjacent bridle trail starts about 5 miles past Bloomingdale, at the trail intersection with 52½ Street, and runs for 7.5 miles to 68th Street, a mile beyond the town of Kibbie. Here, the blueberry industry is going strong. Look for signs for “pick yourself” blueberry farms around Grand Junction and west to South Haven, which hosts the annual National Blueberry Festival in August. Just 2 miles past Grand Junction, you’ll cross the Camelback Bridge, named for its unique midspan hump that was a structural support common in the 1920s. 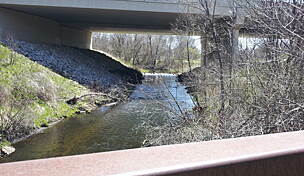 Another bridge, this one covered, about 9 miles past Grand Junction signals that you are nearing the end of the trail. Head uphill to the South Haven staging area alongside the Black River. A bike route leads into town where you can see the South Pier Lighthouse, dating back to the early 1870s, standing over the mouth of the Black River. To either side of the river, North Beach and South Beach offer fun places to play and take a dip in Lake Michigan. A trail connector/streetscaping route heads about 2 miles through downtown South Haven to the northern side of Aylworth Avenue and the northern endpoint of Van Buren Trail State Park. 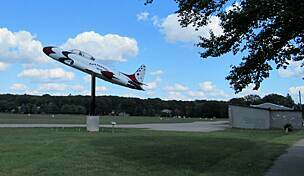 Here, you can head 14 miles south to Hartford or take a short spur southwest to Van Buren State Park, adjacent to Lake Michigan. 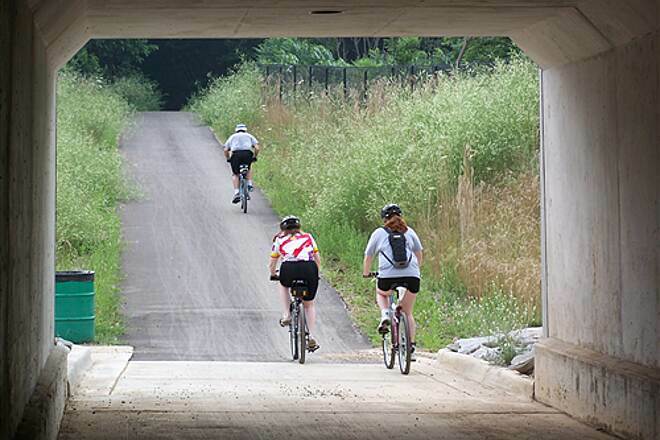 To reach the Kalamazoo trailhead from I-94, take Exit 74B for US 131 N./Bus. Loop I-94 toward Kalamazoo/Grand Rapids. Merge onto US 131 N./Bus. Loop I-94 E., and continue for 2 miles. Continue on US 131 N. for another 2.4 miles, and then take Exit 38B for MI 43 W. toward South Haven. Merge onto MI 43. Turn right onto 10th St. N., and then go 2.1 miles. Turn left into the trailhead and parking area. 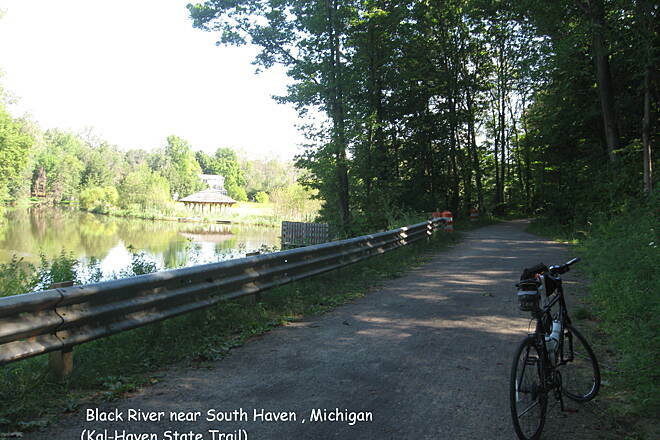 To reach the South Haven trailhead from I-196, take Exit 20 onto Phoenix St., heading west. Go 0.4 mile, and turn right onto Blue Star Hwy. Go 0.5 mile, and turn left onto E. Wells St./Second Ave. After 0.3 mile, turn right on N. Bailey Ave., the first street off the traffic circle. Go north about 300 feet and turn right into the trailhead parking lot. I rode this trail in June of 2017, and had a great time. 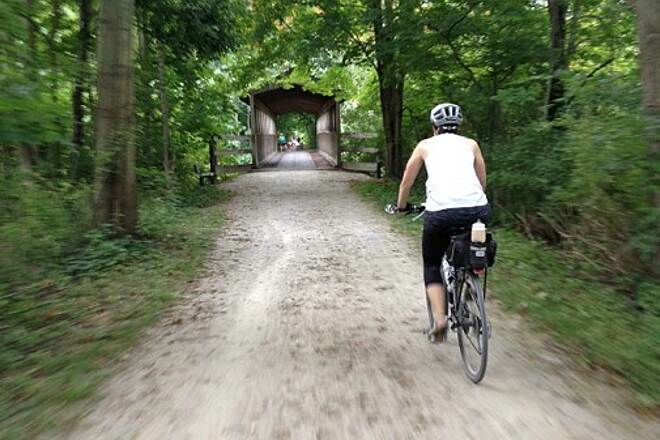 I rode from South Haven to Kalamazoo, biked into town for food, and then hit the trail again to return to South Haven. It's a ride I would do again. Trail conditions - the surface was quite nice. Not too many potholes. Under the right weather conditions, I'd feel great riding this on a road bike with 28mm tires. 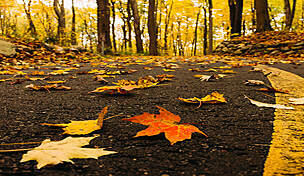 However, I ran across plenty of twigs and small limbs on the road. I might be hesitant to ride with a caliper brake road bike because of them. 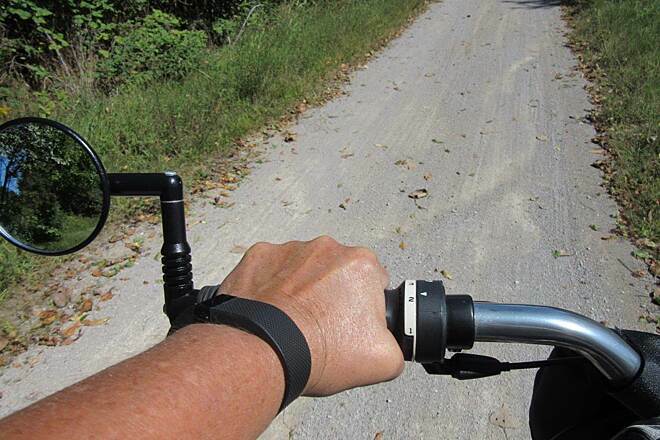 When I rode the trail, I used a cross bike with 38mm aggressive tires and cantilever brakes. I didn't feel that the tire friction was too much - in fact, I was happy with my pace for the day and felt like I didn't have to fight too hard for it. The limbs and muddy spots weren't an issue. I thought my setup was a great fit for the trail, although in the right conditions you could probably get away with anything from a road bike to a mountain bike. Scenery - it's not breathtaking by any means, but there is a variety, and I found it pleasant. There was open farmland, thick brush, swamp, and forests to ride through. The climb in the forest up to the Kalamazoo trailhead was particularly nice. Amenities - there was plenty of water along the route. And while the trail didn't directly pass through many towns, about every 5 miles there was some sort of town that was close, so I never felt concerned for my water or food situation. 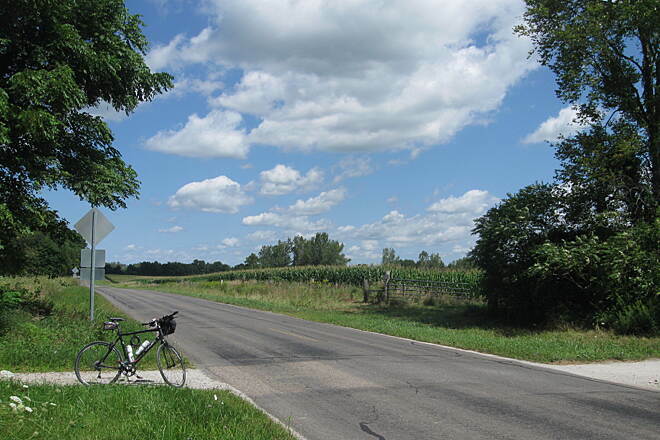 Topography - It seems pretty flat when you ride it one way, but the elevation difference between Kalamazoo and South Haven is sure noticeable when you turn around and ride back the other way. If you're planning to do the full out and back, keep this in mind. 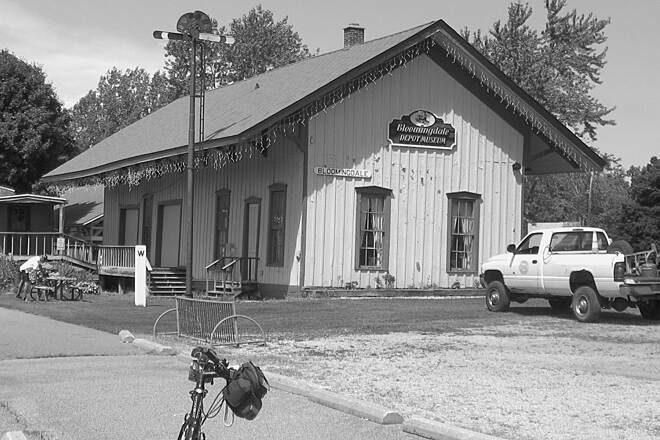 - Bloomingdale was a cool town to ride through, and sits at the halfway point of the trail. If you're looking for a shorter ride, this would be a good turnaround point from either end. 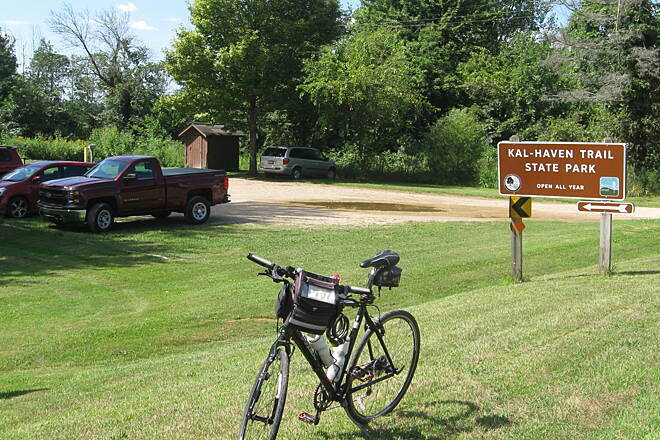 - Biking to fast food from the Kalamazoo trailhead is a bit of a ride, and features plenty of traffic. It is perfectly doable though. - Wading out in the beach at South Haven was a great way to cool off post-ride, and I'd recommend it....if you don't mind getting very sandy. My husband and rode this trail for the first time and loved it. It amazes me that people call a trail such as this boring. 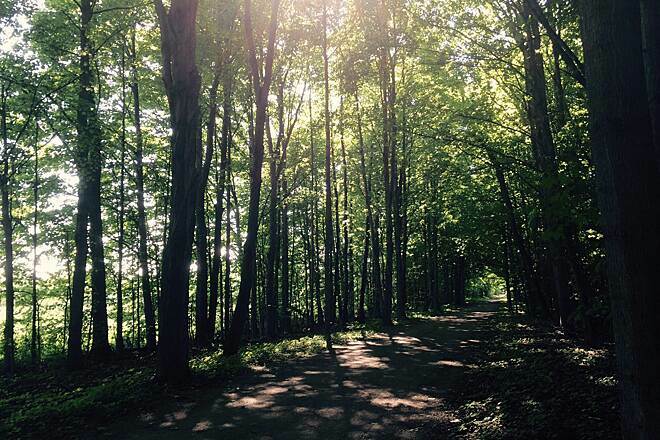 It is beautiful nature----loved the first part out of the Kalamazoo trailhead---pristine and full of lush trees. 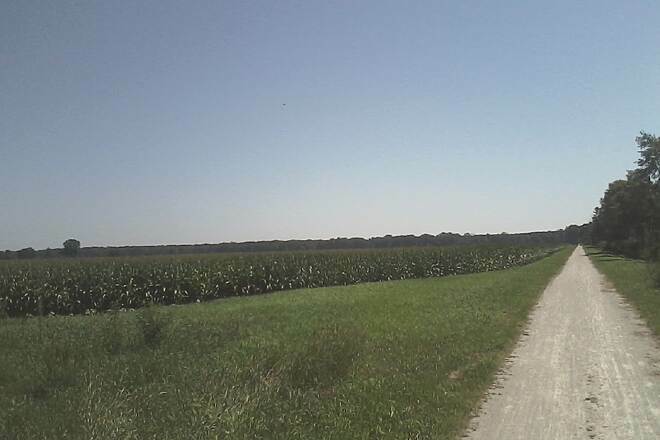 We rode 10 miles and turned around and saw rolling landscapes and agriculture. Gentle incline but be prepared that it is a gravel trail. After the first mile it became hardened and easier. Also---keep your heads up for the crossroads. Next time we will start in South Haven. Beautiful and we are very appreciative that we are provided with trails such as this to keep us off the road. Rode this trail yesterday. It is the most beautiful trail I have ridden. This trail seems to have a lot of road crossings, but only a few had any real traffic. The limestone is packed down, almost like concrete in areas, and loosened up in a few areas, resembling sand. It could use some maintenance to fill a few holes in the trail, one of them jarring everyone in my group hard enough that we each checked to make sure we didn't blow a tire. 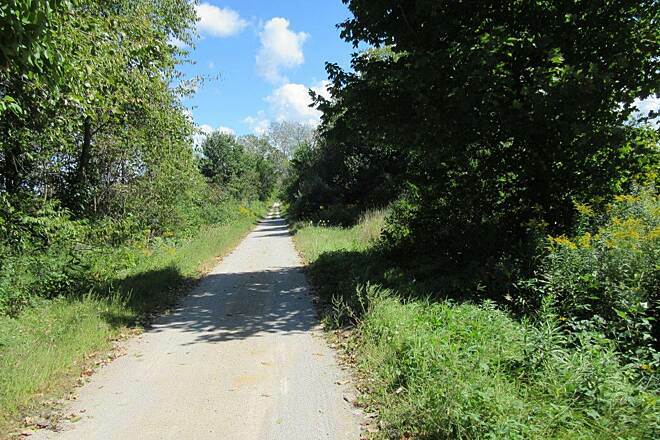 The trail is paved through Bloomingdale. The trail is mostly shaded with a few open areas and cornfields, and as a previous review said, there are chipmunks everywhere. One just sat in the middle of the trail while I rode by. 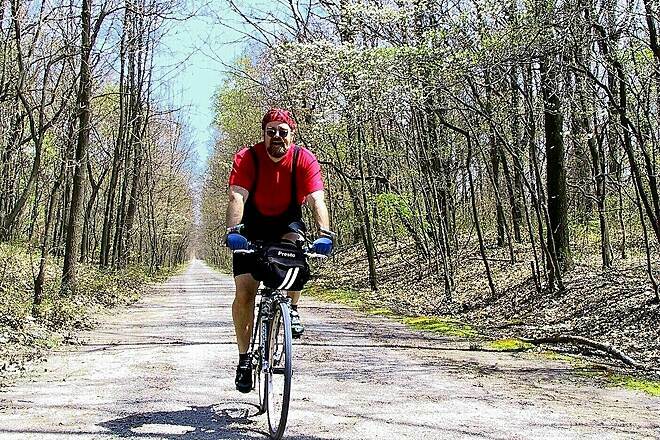 Traveling from Kalamazoo to South Haven, the trail slopes overall downhill. I would like to ride this trail again. We rode west from Gobles 11 miles and back. The next day we rode east 10 miles and back. 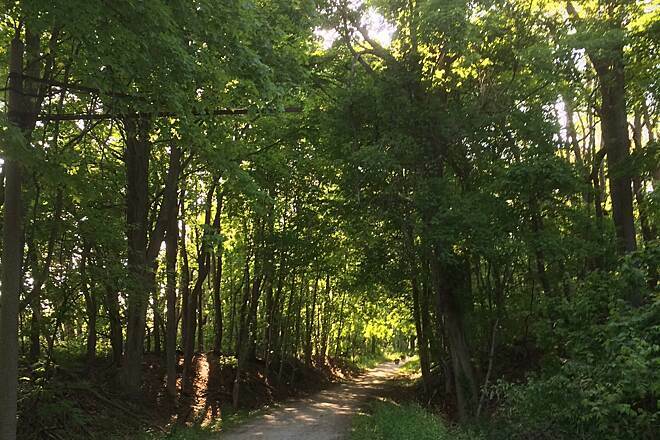 It's a beautiful trail, mostly a tunnel of trees. We've got to come back in the Fall because it will be awesome when the trees turn to Fall colors. In between our rides it poured rain for several hours but there was no evidence of it on the trail. It was high and dry. nests in some sections of trail. most part, intersections have rarely posed a challenge. If I had to rank Michigan trails, Kal is easily in my top 3. Just a wonderful trail through untouched landscapes in Western Michigan. Goes right by my childhood home and street. Will always remember my mother walking me down the trail. We ride the Kal Haven usually once per season, sometimes we start in South Haven, this time we started in Kalamazoo. We have road bikes and crushed limestone can be a little difficult especially if it's really been dry out, my tires slipped some but not as bad as some trails. After killing a chipmunk earlier this year, I find trails with a lot of small wildlife to be a little stressful, on the trail there was 2 snakes, one frog, one turtle (which we moved to safety) and an abundance of chipmunks and squirrels, the leaves and branches make it hard to see until you are right on them and the chipmunks seem to make a sport of darting out in front of you. I managed to miss hitting all of them but I found myself watching the trail instead of enjoying the scenery. The 1st section from Kalamazoo to Alamo is mostly descending, while it makes for an easy pedal there, it makes for the last 3 miles or so, at the end of the ride, to be a bit of work. We turned around in Bloomingdale, about 35 miles round trip. One really bad connection between the trail and street not too far east of Bloomingdale, wasn't going that fast but I couldn't avoid it without skidding out because of the surface. Trail is very nice. I would be nicer if paved. But all in all, still a nice trail. We got on in South Haven. 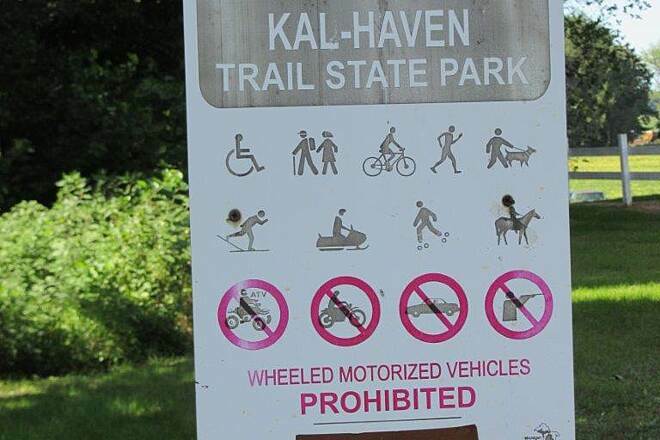 We went through the town of South Haven (Bike lanes) and followed the signs to get to Kal-Haven State Park-Trail. . IF we had a vehicle, they have a very large parking lot. 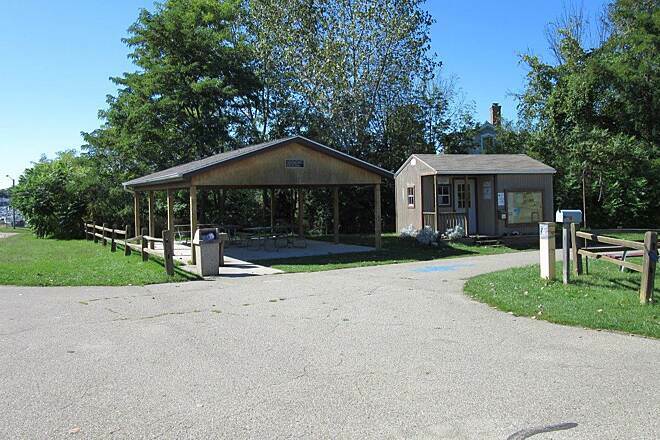 With a picnic area and restrooms. We biked out about 10 miles passed Kibbie, then turned around. 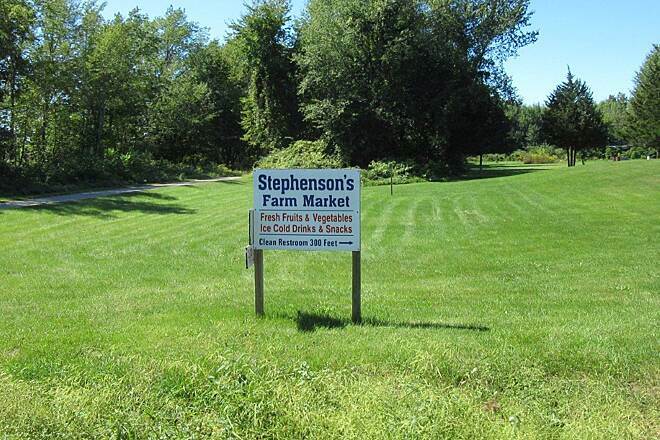 A few miles out of South Haven, a stones throw from the trail, is a Farm Market with cold drinks and rest rooms. We came across one rest room in Kibbie. 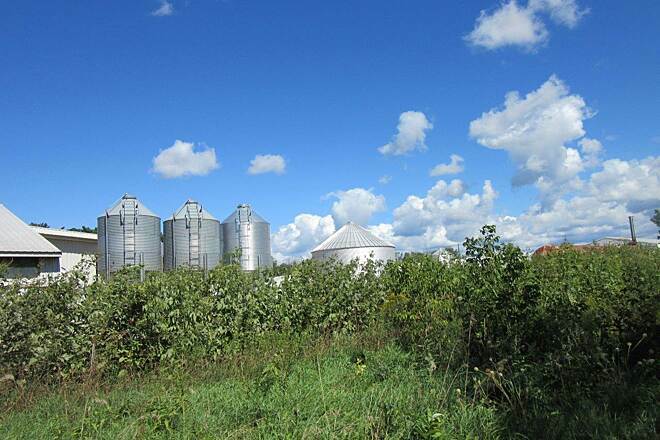 Trail starts out in town and as you go out, it's more country like and farm lands. Travel is gravel. We were a group of women of 15. The trail was nice, cool breezes, plenty of stops available every now and then. Stay right in town at Hotel Nichols in South Haven. They have a bicycle room which was very convenient. we did not have to worry about the mess and muddy bikes. breakfast was included and the onwers was fabulous. Loved the trail ande verything else. 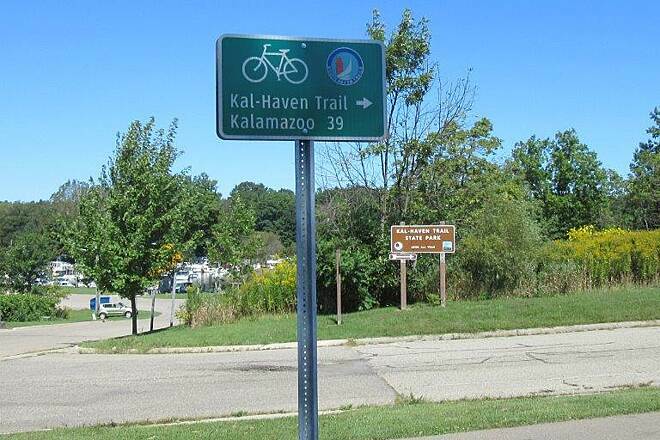 My son and I rode this trail about 4 years ago from K-Zoo to South haven, camped overnight and rode back. It was the first bike trail either one of us ever rode a bike trail, so it holds a special place in our memories. Its always great to ride with loved ones. You will cherish the time together forever. Did this trail couple of weekends ago. Rode from Kalamazoo trail head up to South Haven and back.. The ride surface was decent. There are few driveway crossings which are in bad shape so watch out. The surface has eroded and you will get a bad jolt if you are not careful. There is nothing much to stop by and see on the way except for the museum at Bloomingdale. 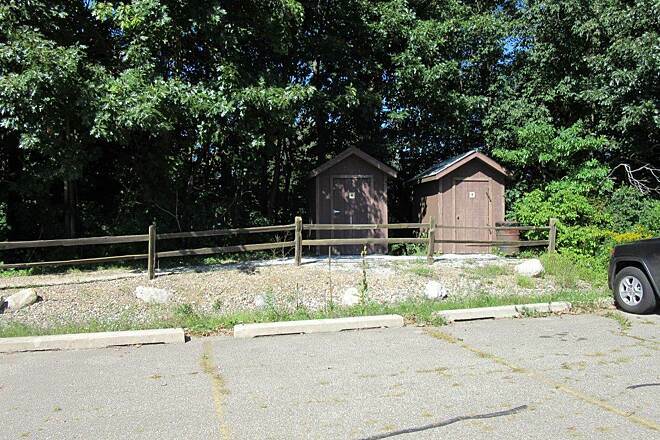 The pit toilet at the Kalamazoo trail head was quite unsanitary and foul smelling. There are some benches near each end points but very few in between. Rode the Kal-Haven on 8/2. Beautiful weather and the trail was in good shape. Started from the Kalamazoo trail head and rode to South Haven. Had lunch at Joe's Bar & Grill and rode back. The ride back was a bit more difficult due to the slow from west to east. Lack of nice restroom facilities make this a 4 star instead of a 5. Put overall, a great experience. 34 miles one way. It's a great, mostly smooth ride. Riding east is at more of a incline, but riding west is much faster. Plenty of parking, water and rest stops. Well maintained. 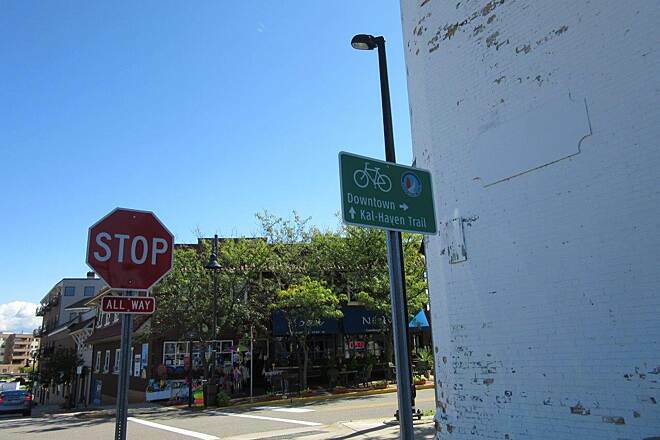 I round tripped the Kal-Haven starting in downtown South Haven, then picking up a few miles on the KRV trail using Bell's brewery general store in Kalamazoo as the turn around point. I was running 700x25 gatorskins on a dedicated roadbike. the trail offers a variety of topography and scenery along the way. There were a few spots of trail where you have to pay attention as a 25mm wide tire could be swallowed up, or some chunky gravel bits, but on the whole the trail is easily doable on a roadbike. Also worth noting, there are some excellent north/south roads to cycle if you want pavement (66th road aka hiway 687 intersects the Kal-Haven trail and one can take this all the way up Douglas/Saugatuck area - the road was freshly paved with very low traffic). This trail is great and has some awesome people using it. 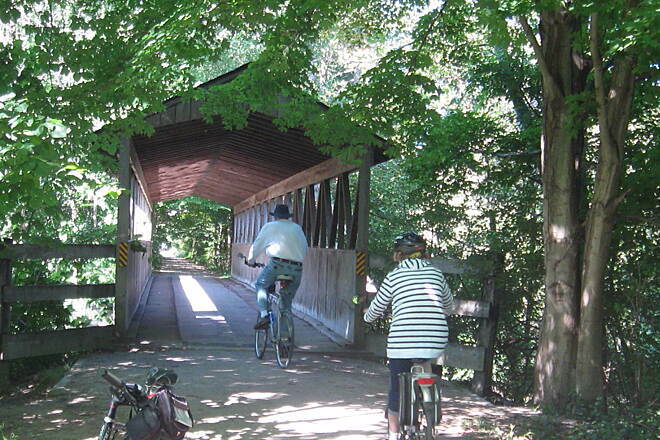 I have been long distance training on a fully loaded touring bike, On Easter Sunday 2014 I rode from Allegan Michigan to Bloomingdale to get on the trail and head west to South Haven. After visiting a friend I decided to get back on the trail and take it to Kalamazoo. When I got into town i went to get some bananas and found that my wallet was missing. I went back to the trail and rode it back to South Haven. It was about 1am when I got there and no wallet. I set up my hammock tent and camped there. In the morning After making coffee and rice (essentials I carry) decided to try one more time and headed back to Kalamazoo. When I hit Bloomingdale my phone went off (I keep it charged with a Bushnell solar charger). Someone had found my wallet and turned it into the Michigan State Police station in Wayland. My wallet had just under a grand cash in it. The money was still there... So, this is the best trail I have ever been on. It's a nice easy ride with awesome people. Be nice, smile and wave. I do, I think it may have helped. Is the trail surface good enough for road bike tires? Or, will it result in punctures? I absolutely loved the entire trail, end to end. I rode the trail in its entirety twice in a row, I enjoyed it so much(over 4 days) The scenery is very green with abundant wildlife and wildflowers, butterflies, and birds. It was very smooth and easy, with a mild grade. Beginning in Kal and ending up at South Haven was a Grand, exciting finish. What better way than to pull your bike right up to Lake Michigan, after a hot, dusty day and feel the cool wind in your face and hear the crashing waves. I chained my bike to the deck rail and took a walk in the sand in my bare feet. It was awesome! Unfortunately, I had to delete one star for the miserable factory beef farm along the trail. This filthy, foul smelling, cruel entity was an eyesore and shameful example of how not to "farm" (and I use the term loosely) having been a farmer myself. There were several small homes near there, with individuals who had to see and smell that everyday, and I am sure it brought down their property values, as well as destroyed the section of the trail. The owners even had the gall to put up a sign boasting their NATURAL raised beef! Disgusting! Aside from this small section, the Kalhaven is a beautiful ride and worth the small user fee. I am a woman riding alone, and I never encountered anyone but a few friendly people and no problems with car break ins or any scary areas. Hello. My name is TBox and I am a Rails-to-trails-aholic. So is my wife. It's awesome. Back in the day, we were avid road riders until we got tired of outrunning angry dogs and drivers paying more attention to what is on their phones than what is in front of their car. 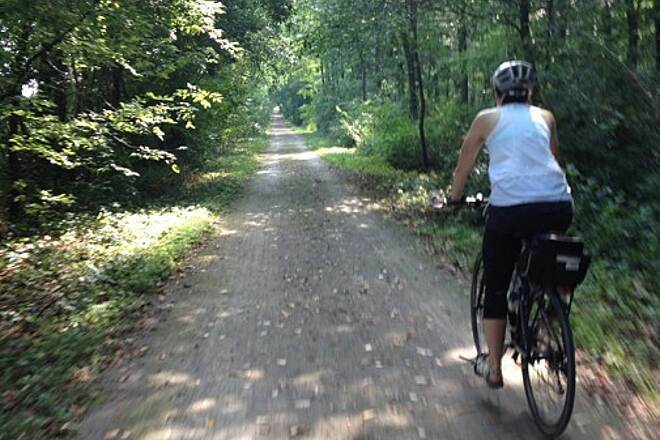 Discovering rails to trails rides has literally given us a new lease on our bike riding lives. We now take long weekends (or more, if possible) and seek out new rails to trials rides. The KalHaven Trail is less than 2 hours from our house and is worth every second spent driving to the trial head. This was our second ride on what I'm sure will be many trips on the KalHaven Trail. 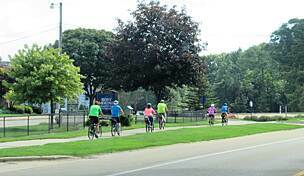 We started in South Haven and rode to Kendall (about 25 miles from South Haven), where we refueled and turned around and headed back to South Haven. Of all the trials we ride, this one is one of the most easy-going rides. Being crushed stone, you don't see many of the "Tour De France (North America Branch)" riders trying to set new land speed records while dodging children and the elderly on the trail. 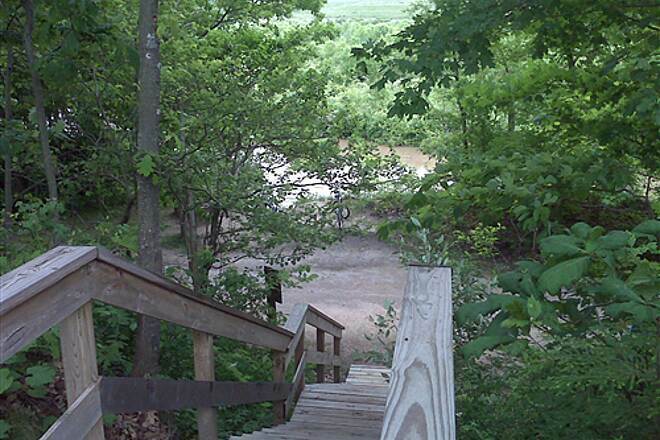 Don't let the crushed stone scare you away, if you have never tried this trail. It is super smooth and easy riding for whatever you ride, even skinny tire road bikes would be okay on this trail, although it's perfect for mountain, hybrid, or cyclocross bikes. Just be prepared to give your two wheeled baby a bath after the ride. They do get a little dusty after a ride on the KalHaven. Also a great trail to ride on hot, summer days. Lots of shade throughout the trail. After the ride, plenty of great places in South Haven to grab a beer and some grub. The perch tacos at the Black River Tavern were awesome. Give this trail a try. You'll love it. Very scenic, nice ride, but watch the highway curve! My wife and I rode this trail with some friends. We left South Haven and rode to out 15 miles to Grand Junction and then back to South Haven. Our friends like to ride but had not been on their bikes in a while and we had gone fifteen miles before we knew it. It is a rails to trails so it has gradual but sometimes long grades, nothing bad. 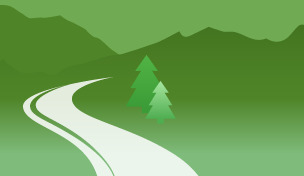 The path is in very good condition; however, I gave it four stars because there is one part of the path where you must cross a busy road on a blind curve. When you are biking west toward South Haven you cannot see on coming cars around the corner and they are flying through there, right up on the bike crossing - it is REALLY dangerous. The highway department or Natural Resources Department needs to do something to avoid that intersection (bike bridge, large flashing light activated by bike riders, something). If you are riding with your kids BE VERY CAREFUL. The path is very scenic. 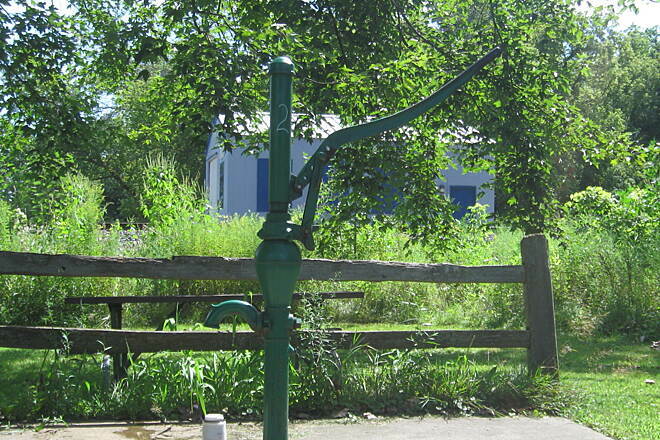 About five miles or so to the east of South Haven there is an old fashion well pump rest stop on the trail where you can refill your water bottle with fresh water, possibly spring water. Have fun! I've been riding this trail for well over 10 years and haven't gotten tired of it yet, even though most of it is fairly straight. As it is not paved I suggest a touring or mountain bike (or hybrid). The trail is very scenic, especially in autumn (colors) and in spring on the eastern end millions of Trilliums--pun intended--and other wild flowers. This is also the greatest incline up to the trail head on 10th St. north of M43, where it runs without any interruption into the Kalamzoo River Trail. 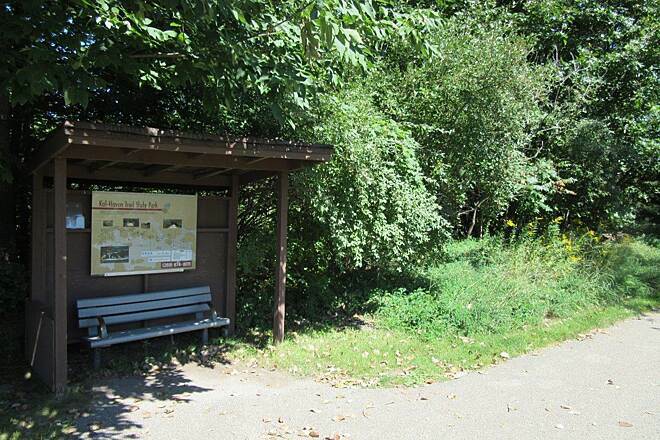 There are 2 primitive camp grounds on the trail in Kendall, about Mile 24, and near South Haven at Mile 1. My favorite, wooded, peaceful section runs from Bloomingdale to Grand Junction. There are several hand operated water pumps and picnic tables on the trail and a nice gazebo at Mile 4, put up by the Kibbie Reformed Church. The western end is also beautiful with a covered bridge and two picnic spots on the Black River, one shelter just west of the covered bridge and one on the brand new (paved!!) section continuing past the trailhead into downtown South Haven near the municipal boat ramp on Wells St. From the boat ramp you have to ride on the streets following the river to the draw bridge then left and immediately right up Williams St. along the marina to Lake Michigan. To my delight, most of these streets have just been repaved with added bicycle lanes! For a lunch break, stop at one of the places in Gobles, Mancino's Pizza just south of the trail and north on M40 my own personal favorite: Jan's Trailside Cafe, a hole in the wall with great food, incl. authentic pasties for those from the upper peninsula of Michigan. 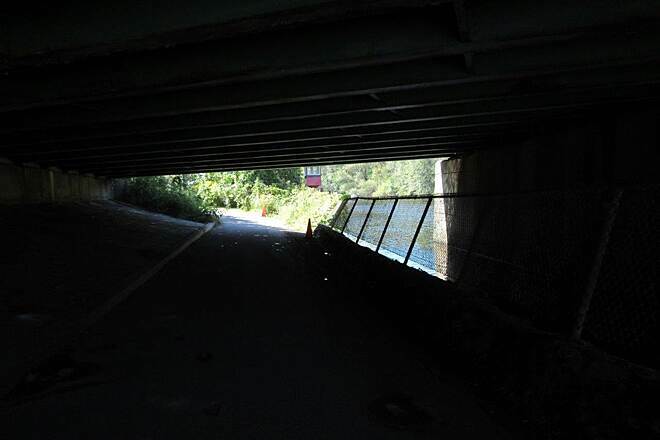 See you soon on my favorite bike trail! The grades are gentle, the scenery was nice, but we were not prepared to ride on a non-paved trail, basically a dirt trail. We pulled a Burley and it is less than ideal. We rode from Grand Junction to South Haven and back, which is 10 miles on the trail. We wouldn't do anymore pulling something. We just got my 5 and 7 year old off of training wheels and decided to give a light ride a go on the Kal-Haven Trail. It was a huge success! It's a fairly easy ride with a very forgiving surface. We live near the K-Zoo trial head and hopped on, went 2.5 miles in, had lunch, turned around and road back to the trail head. It's mostly downhill heading west into the trail which made the ride back a bit slower but the grade was light and was easily manageable by my 5 year old (with dad giving him pushes every now and then). 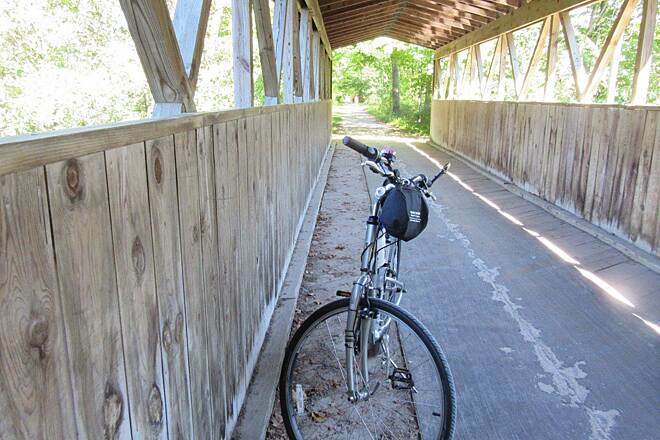 Love the trail and the Kalamazoo River Valley Trail is nice too for the little ones, it's paved! Get out and ride! Riding this trail is the highlight of my year. 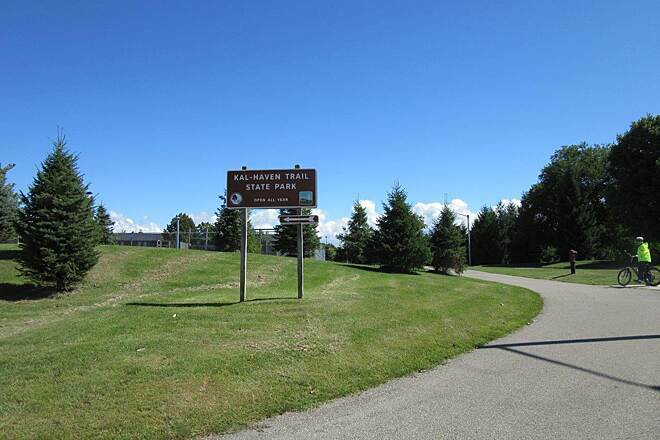 I have ridden the Kal-haven trail three times and walk it frequently. In the early spring there are fields of wild flowers and Trillium. In the fall the leaves are amazing. If you pay attention there is all kinds of wildlife. I frequently see deer, turkey racoons and have seen several red tail hawk. All kinds of birds everywhere. You are riding through woods and small towns. There is also a town that closed many years ago. This trail is beautiful, if you don't see any scenery you might consider slowing down and experiencing what the trail has to offer. The trail ends in beautiful South Haven Michigan where you can go to the peer and embrace a beautiful sunset. South Haven has nice people, great shops and lodging. This trail ride in my opinion is a must experience. Have a great ride. June 24th 2010 FUN RIDE!!! 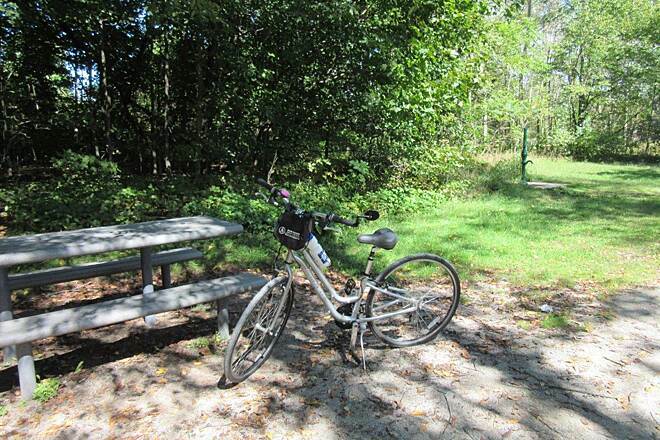 We stayed in South Haven and booked a bike shuttle that dropped us off at the trail head on 10th street in Kalamazoo. The shuttle service has a limited space and books quickly but was a very good deal at $6.00 per adult including the bike. They picked us up at our B and B. The number is 269-427-7921. We biked the entire trail from 10th Street, Kalamazoo to South Haven.There had been a lot of rain immediately prior to our arrival. The trail was still in really good shape. There are some washouts and slippery spots but they were not unpassable or dangerous. We had mountain bikes. You need to purchase a pass to use the trail. There were staff at each trail head selling the passes and a few t-shirts and drinks. There are primative toilets all along the trail. 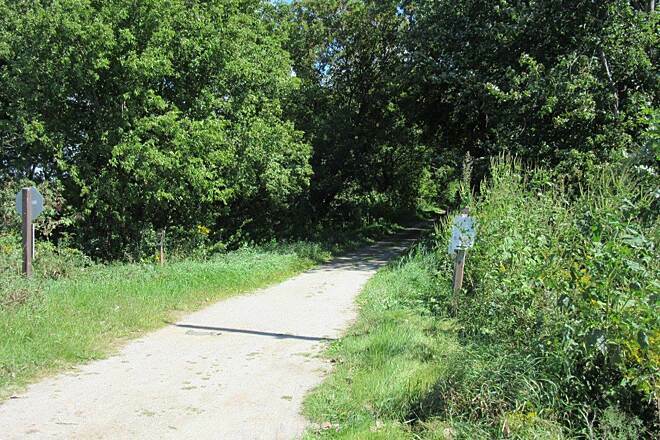 On June 24th 2010 there was a trail closing on the trail near 36th street. Make sure to ask for specific directions around it. We had some and with some common sense we found our way back to the trail. It requires you to ride on the road for a couple of miles. It actually is a pleasant ride. The ride starts downhill for quite awhile from the 10th street trail head. It is gravelly and dirt. It is firmly packed in most spots with some sand piles. 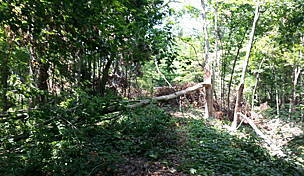 It is goes through a lot of wooded areas and has a lot of shade. Most places are wind sheltered although you do come out in a few open areas. 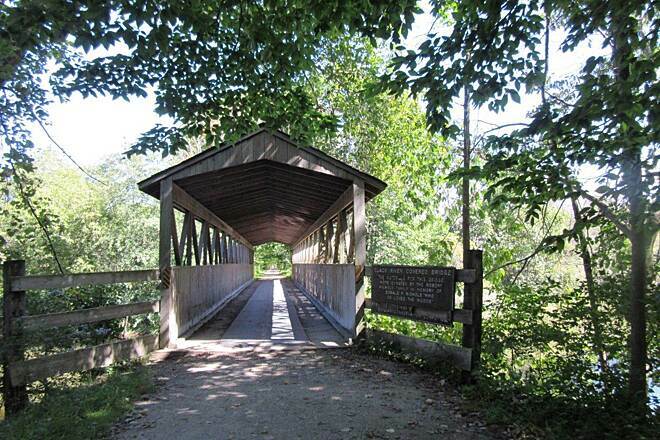 There are three small humped bridges and you cross a few streams and a small covered bridge near the South Haven end of the trail. It seems mostly down hill from 10th street. There is a small hill as you begin to approach South Haven. If you want to fly you could really rock this trail - if you don't mind some dirt and gravel and sand. There are a lot of stop signs to cross roads some are paved some are sand. You need to watch for these if you are racing down the hills. You will go through a few small towns but we didn't stop in any of them. It appears that the trail is well maintained and I wouldn't be surprised if they are replacing the gravel after all the rain. Even though we went from one end to the other and it was a lovely day we saw very few people on the trail. We plan on riding this trail again. We have spent many a cold day on the trail in the winter but have recently taken our bicycles to test the trail. It was great. We decided to make it an event rather than just another bike ride. We choose to spend the night and bike back on day 2. The greatest scenery is as you near South Haven and ride parallel with the river. 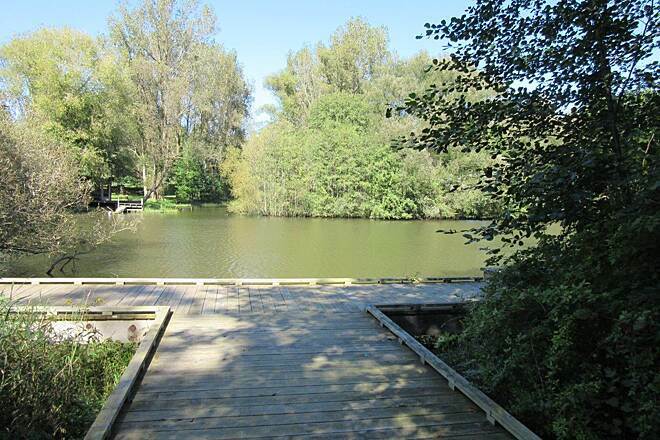 You also will cross the covered bridge and as you are almost into town there is an amazing new boardwalk and pavillion that reaches out into the river. I am guessing it is for public use but it appears so new that not much signage . Once in town we found this charming Inn close to the trail and were able to secure our bikes in the shed. We were at Inn at the Park B&B and when we arrived, they served us a glass of wine and some appetizers and fed us a great breakfast before we headed back home via the trail. We hope to get some freinds to do this 2 day trip and revisit the Inn sometime soon. 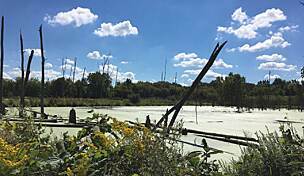 "There isn't much for scenery on this trail except in the Kalamazoo and South Haven first few miles. In between, it gets really boring and when you near South Haven, coming from Kalamazoo, it's a real drag seeing all the graffiti on signs. If you want the exercise, it's a nice ride and very flat. If you want scenery, good luck." 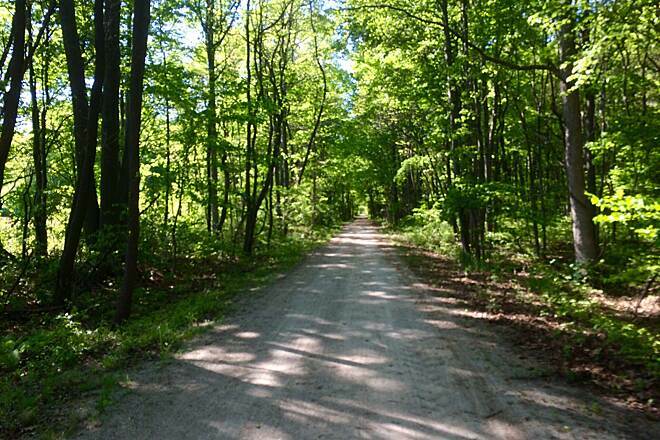 "The KalHaven trail is one the nicest and more scenic unpaved trails in Michigan. 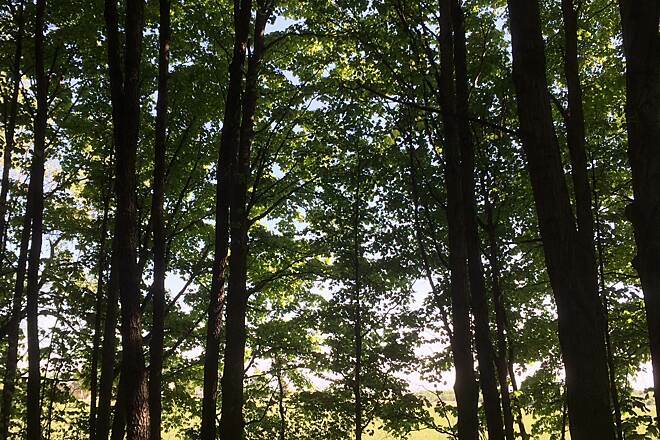 The canopy of trees go on for miles and miles. It makes a huge difference in temperature on a day like yesterday when it was eightfive degrees. It was still a very comfortable ride. 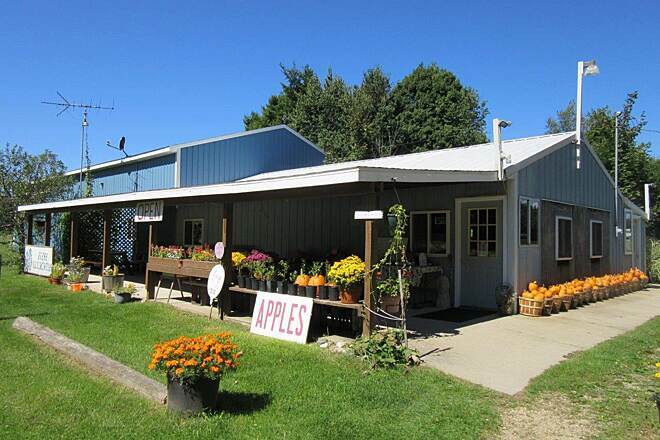 For good eats, Jans Trailside in Gobels has great food and prices. I usually park in Gobles and ride to either Kalamazoo or South Haven. In a ealier post the person mentioned the problem with cars getting broken into; however, that was an isolated incident. Both trailheads now have attendents and cameras so hopefully the problem is a thing of the past. I only wish the trail was closer to Grand Rapids. Enjoy (:"
We rode the first 10 miles from South Haven to Grand Junction. The trail is nice and shady. Water along the way is nice. Stopped at a blueberry farm to pick blueberries which was fun. Not much in the little towns as one of the websites for this trail described. Overall a nice ride. "Rode the eastern section from Kal. Nice railroad grade, hard base with fine crushed stone. No sign of horses, only a few lone ground hog holes. Plenty of rest stops if you need. 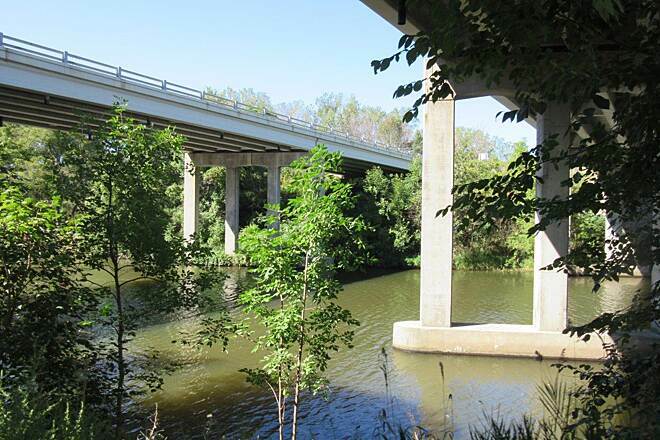 No railroad bridges on this eastern end (18 miles). Plenty of shade with canopied trees." "Rode the trail 10/21/05. Trail in great condition. Started at Kalamazoo. 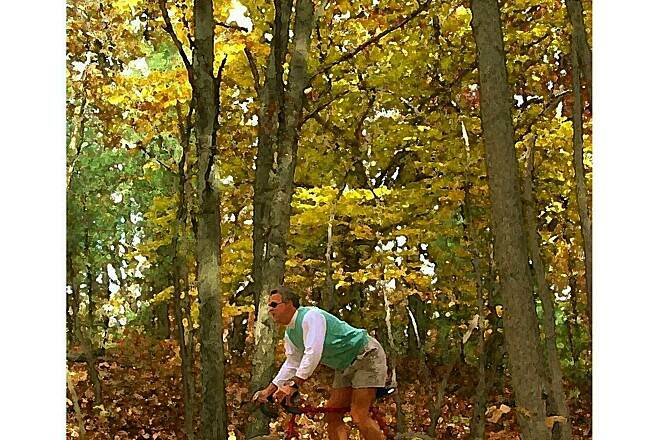 Fun ride, not very many hills, great view of Fall colors and countryside. Trail Ranger was very friendly and informative. What a great way to spend the day!" 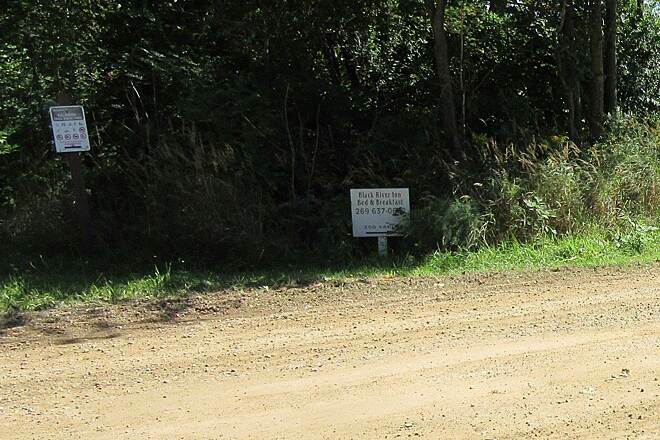 "We have ridden sections of this trail this spring and summer. 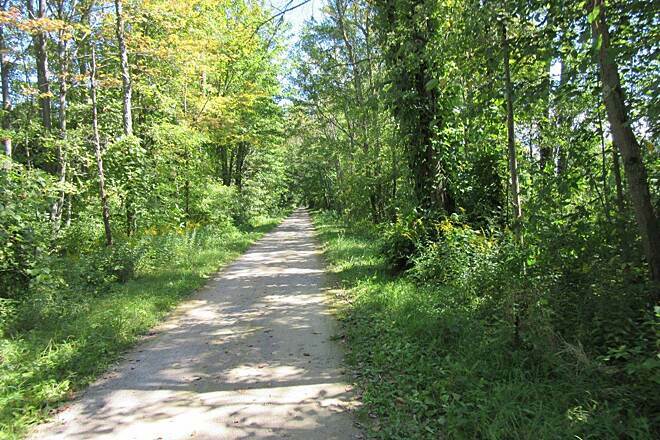 Since the fee system was re-established to provide funds to VanBuren County to maintain the trail it has improved. 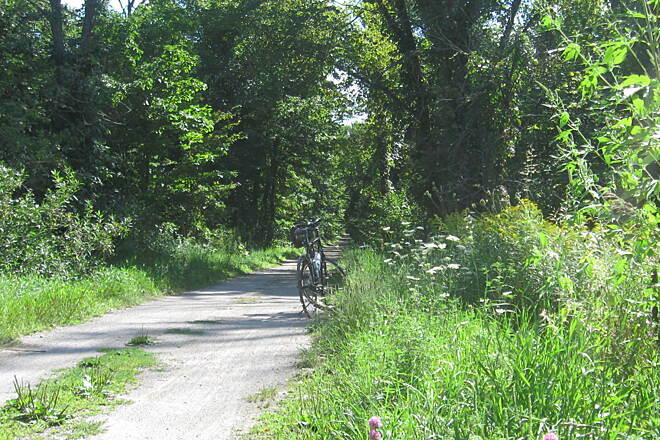 However if you ride from the Kalamazoo end toward Bloomingdale watch out for the section at Mentha (where the path tranverses the old mint farms' muck fields (before you reach Kendal) as it is very soft and it is easy to catch a wheel and lose control. I wish the county would simply spread a little calcium cloride on the trail here to absorb moisture from the air and stabilize the trail. What is really strange is that after you have passed this section and have traveled about a mile there is a section that has caution signs warning of loose surface on the trail, but we have never found any loose surface here, but in Mentha, where there is a loose surface, there are no signs warning of the potential danger. Hope someone from VanBurnen County reads this and does something about this problem on an otherwise excellent ride. If we didn't live so far away, 30+ miles, we would buy some calcium cloride and a lawn spreader to spread on the trail. 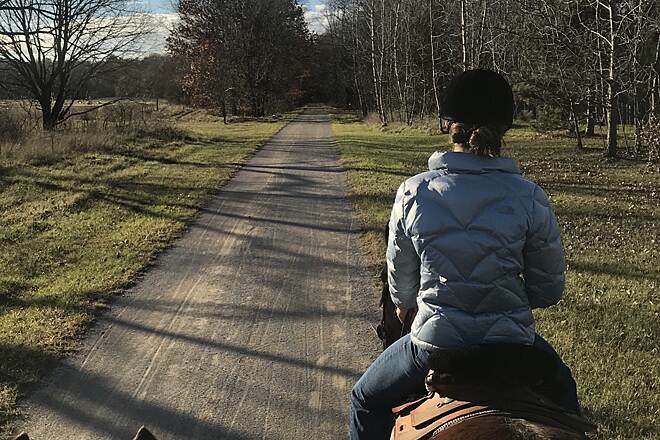 However since we only ride the trail about once or twice a month and I would have to buy both the spreader and the cc, I probably will not get it done." "Good trail, bad parking situation"
"Every day, sometimes five times a day, cars are broken into at each end of the trail parking lots. The place has no security and you will be a risk for terrible things to happen of you park there. It is too bad because the trail is outstanding. Good luck and beware. Call the local police department and see how many smash and grabs there were today." 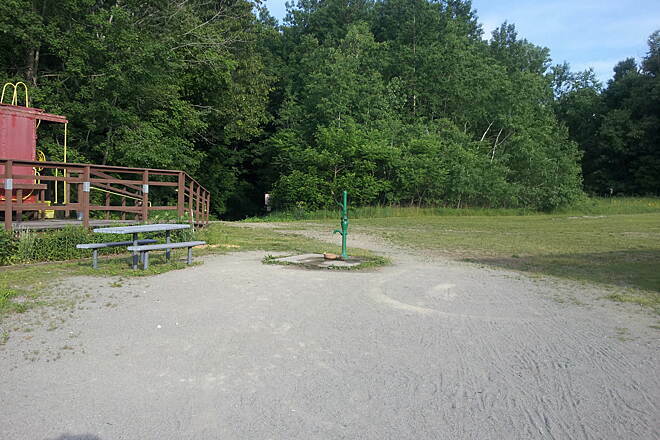 "This trail, which has apparently had its ups and downs in maintenance, has now been taken over by the county. A $3 user fee is strictly enforced, and that seems to be doing the trick, for it was in good shape, and shaded and peaceful too. We rode only from South Haven to Grand Junction (10 miles). At Grand Junction there is a nice Mexican fast-food/ice cream restaurant with picnic tables outside right along the trail. 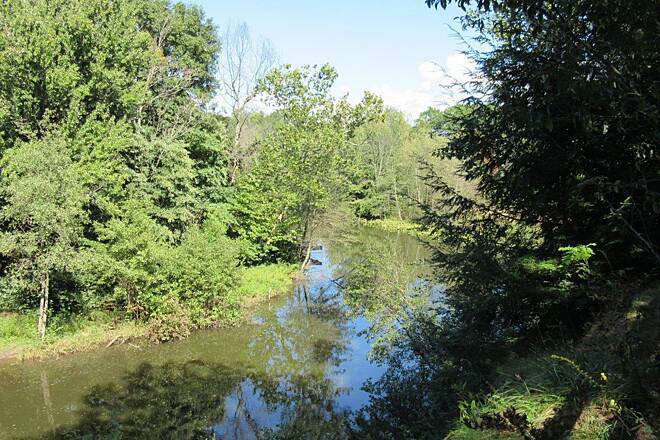 This is a great stop for a trail with few amenities." Try this trail for the scenery and good riding conditions (hardpack). There are quite a few streets and roads to cross but there isn't too much traffic. The traffic on the trail has always been thin when I have been on it (10-15 times). "I have ridden the Kal-Haven several times over the past few years. It had recently deteriorated from lack of care. I was happy to notice that is was much improved this trip. There is a fee once again, but it's worth it if if translates to better upkeep." My wife and I biked this trail in October 2003. It was terrific! We thoroughly enjoyed each of the 66 miles of the trail (that's round-trip mileage). 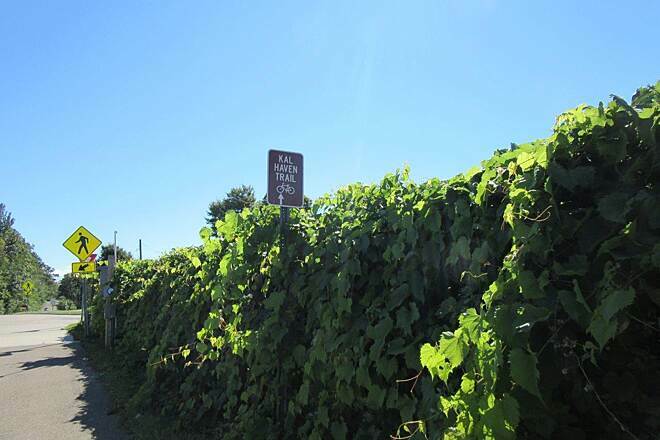 "I've been riding this trail since before there was an official trailhead established just off H Avenue on the east, or Kalamazoo, side. I have seen the trail go from a not-yet-completed facility to having outhouses and pumps with picnic benches every five miles or so. It is such a GREAT ride. I usually start out from my home in downtown Kalamazoo and take the back roads to the trailhead. We then head west, stopping for ice cream at Kendell, Bloomingdale and Grand Junction. We end up in South Haven with less than a mile ride to the Bed & Breakfast. Then we wash up, hit the beach till the sun goes down and then head out to dinner. The next morning we hit the trail back to Kalamazoo and voila, a cheap, exciting, wonderful weekend vacation. The ride is beautiful. There are some open fields and sun. You pass through the Todd Mint farm area (the third largest mint producer in the world). Parts of the trail are raised waaaaaay up, some are low, cross streams, through dense wooded area; it's just a wonderful ride. It is, however, in need of attention. You can ride the entire trail, as I do every month or so, but deterioration is clearly evident. Some punks even burned down an outhouse. I plan to take either a golf cart or a motor cycle loaded with a chain saw, shovels, etc., down the entire trail just to help clean it up a bit. If everyone who uses it does one or two things each time they ride by it will help. I've seen some local folks who live along the trail out mowing on either side. I stopped and thanked them. 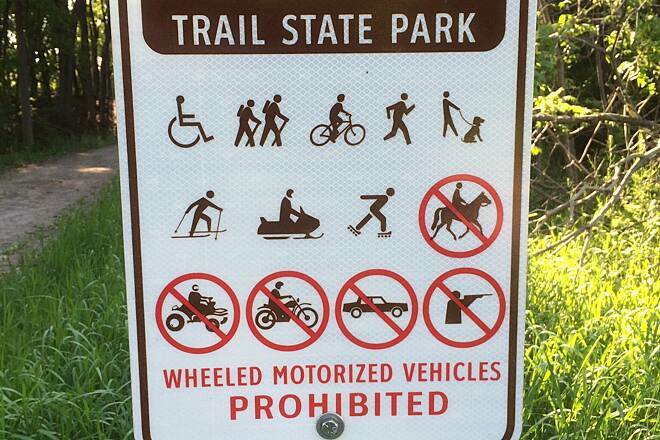 I didn't mind paying the trail use fee when there was a permit required for a few years. Heck, I still have the passes. If that's what it takes, let's reinstate the fees. But let's not lose this trail. 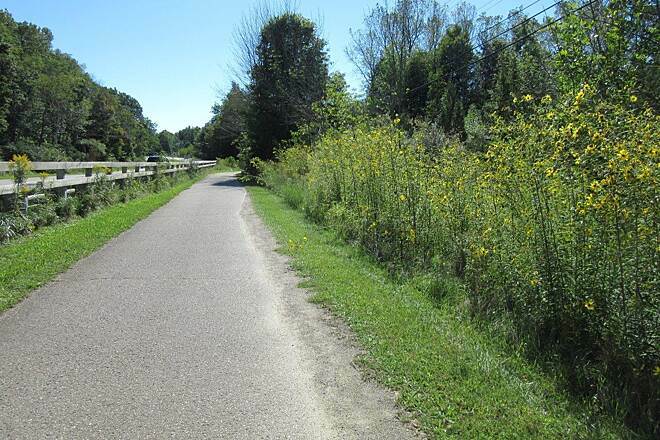 The city of Kalamazoo is working diligently on extending the trail to the downtown area. 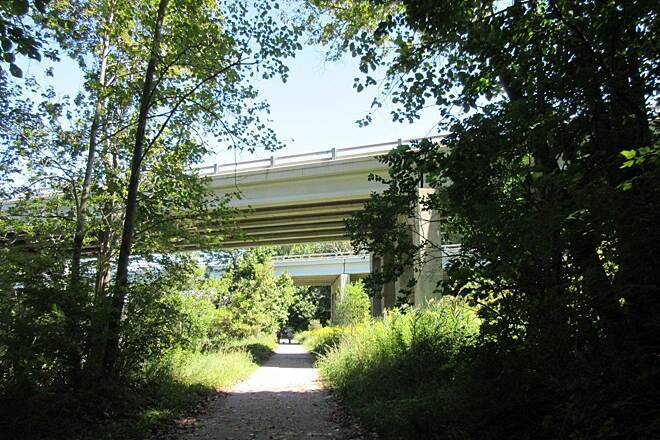 Then they plan to run it along the Kalamazoo River and connect it with the Portage Creek Trail and Battle Creek Linear Park trail. " 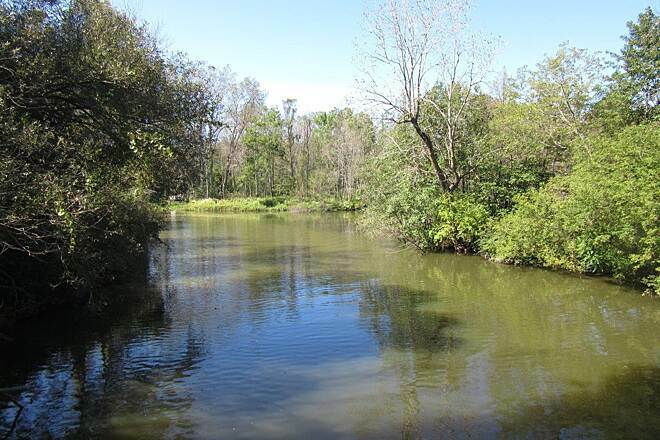 "I have gone both ways on the entire 54 kilometre length of the trail in May and in July. In July it was superb. 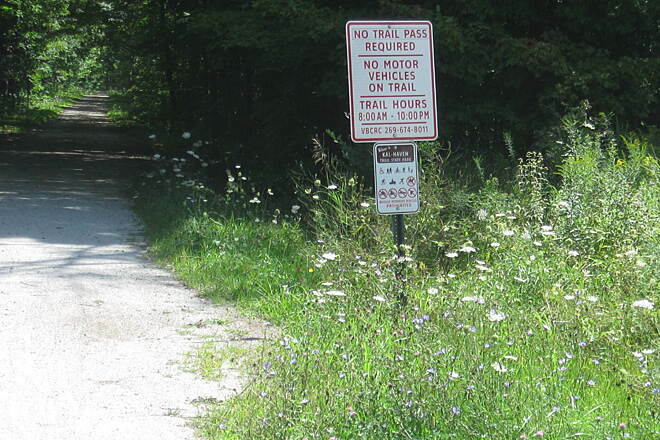 In July there were notices posted to the effect that ""Budget Problems"" in MI had made it necessary to (A) transfer the Park Ranger to another park, (B) remove the trash cans, (C) close down many of the restrooms, (D) render inoperative much of the water supply at the rest stops, (E) that trail maintenance would be discontinued, and (F) that DAMAGE and VANDALISM would NOT be fixed. It did not take long to tell a HUGE difference between May and JULY. In May the trail was definitely a ""5"" whereas 2 months later it is already down to ""2"". Twigs are all over the path. They become lodged in the spokes. Tree branches are everywhere making it necessary to execute evasion maneuvres. Tree limb partly block block the path in at least 5 places. Near South Haven an entire tree has fallen that completely blocks the path. Many of the bathrooms are closed. More often than not, the water pumps at the rest areas are inoperative. Wash-outs and erosions are beginning to appear. Neglecting this beautiful trail is NOT going to save money. It is going to cost money. IT is going much more expensive to refurbish the trail after this kind of neglect than it would b to maintain it properly. I do not know who is responsible for the abandonment of this beautiful trail by the state DNR. But it is a crime to allow a trail of this quality to be so severely neglected. It is truly shocking to see a beautiful trail of this quality deteriorate in such a short time. Something needs to be done about this trail. Fast. " 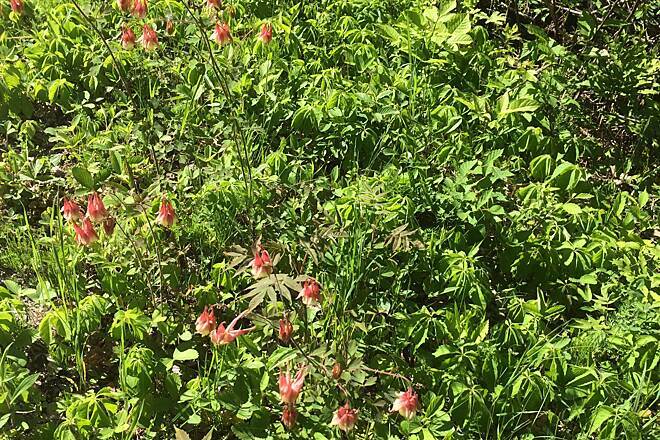 I thought the trail was well maintained and was amongst some pretty wild flowers and birds. I especially liked stopping in Gobles for lunch and the covered brdige was very nice. This is a great trail. If you start in South Haven and ride to Kalamazoo you can get picked up at the end of the trail by the Holiday Inn if you want to spend the night. They will take you back to the trail in the morning for your ride back. 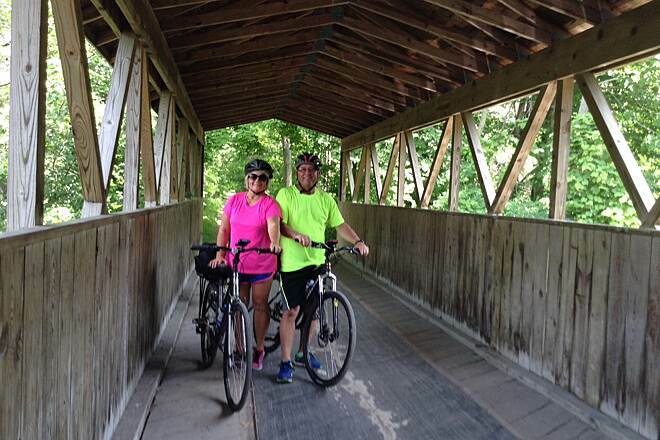 My wife Mary and I just rode a portion of the Kal-Haven Trail this past Labor Day weekend and what a great experience! Well maintained - great scenery - cornfields - meadows - farms - the solitude of forests - friendly passerbys - you couldn't ask for a better experience! The trail is canopied by trees most of the ride. Restrooms and water are frequent. Beautiful scenery. Well kept trail. Butterflies and small wildlife are abundant. Great! 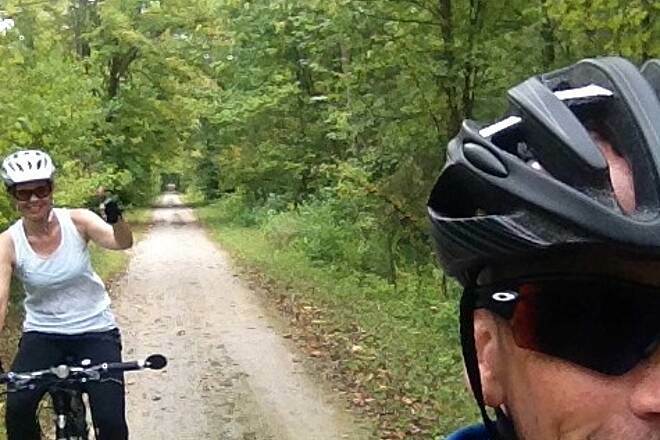 "We enjoyed a delightful mini-3 day vacation by biking from the Kalmazoo trail head to South Haven, staying in a B&B on the beach and biking back to our car. I positively identified 26 types of wildflowers in mid-July and I sure did not know all of them. With a 42 year span between us, my niece and I had a wonderful time. She suggested we make it an annual trip! Good food is available in Grand Junction and Gobles not to mention South Haven which is a town made for walking and bikes. Total 3-day milage=86. 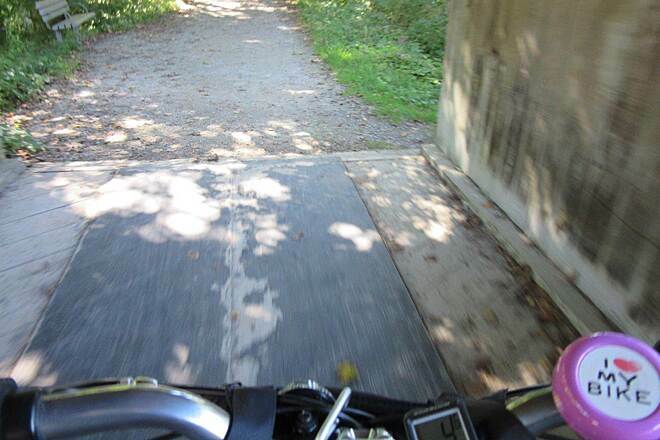 (inclusive)"
"My niece (12) and I took a 3 day weekend and biked the Kal-Haven trail both ways. We left Friday a.m., spent 2 nights in South Haven and returned Sunday a.m. 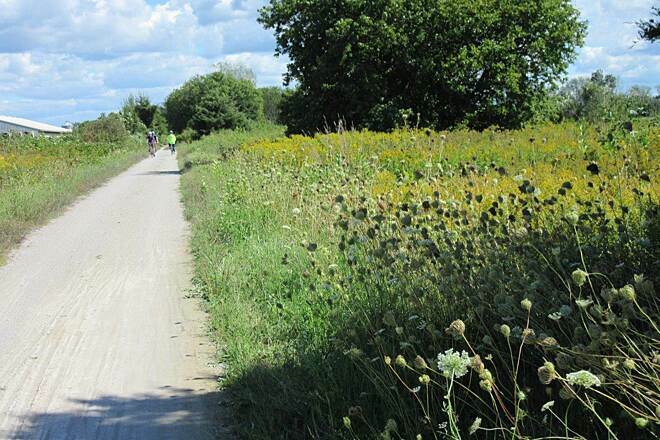 The trail is beautiful with lots of birds, wild flowers and a variety of terrain. South Haven is made for bikers with everything accessable from beautiful white sandy beaches, a drawbridge and great food. They say the trail is uphill all the way back from South Haven to Kalamazoo but frankly they can't fool me. I know it is up hill both ways! Total millage: 83 miles "